Heat oven to 375°F. Make pie crust as directed on box for One-Crust Filled Pie using 9-inch glass pie plate; flute edge. In 10-inch skillet, heat 2 tablespoons of the oil over medium-low heat until hot. Add onions; cook 10 minutes, stirring occasionally, or until onions are slightly golden in color. Add garlic; cook an additional minute. Spread onions and garlic evenly in bottom of pie crust. Arrange vegetables in tight spiral pattern over onion mixture, alternating vegetables. Sprinkle with salt, pepper and thyme. Drizzle with remaining 1 tablespoon of oil. Cover with foil. Bake 30 minutes. Remove foil; bake 15 minutes. 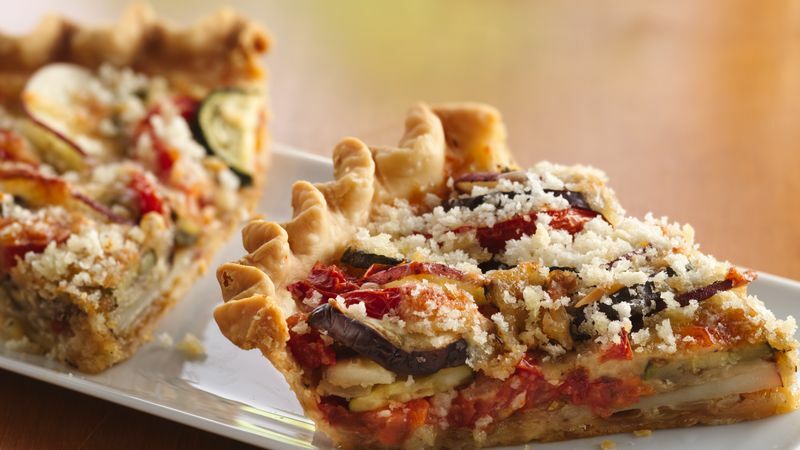 Sprinkle vegetables with cheese and bread crumbs. Bake an additional 10 to 20 minutes or until cheese begins to brown. Cool 15 minutes. To serve, cut into wedges. One and one half cups sliced and quartered eggplant can be substituted for the Japanese eggplant.